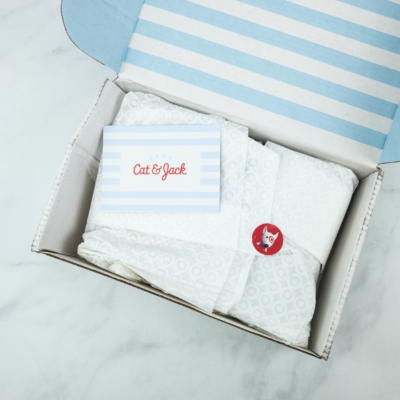 Cat & Jack Baby Outfit Box is a new baby clothing subscription from Target. Each season, they will send out a box that is filled with 6-7 clothing pieces that have been hand picked by their designers. Items might include bodysuits, leggings, rompers and more, as well as an additional gift. 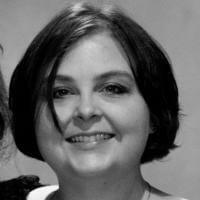 Guests can order as a quarterly subscription or as a single order. Boxes are available only in limited quantities! Each box is $40 and available in sizes from Newborn up to 24 months. Also, any of the items can be returned online or in stores. This box sold out really quickly – be sure to grab notifications for this box using the bell in order to get email notifications when we post about it again! 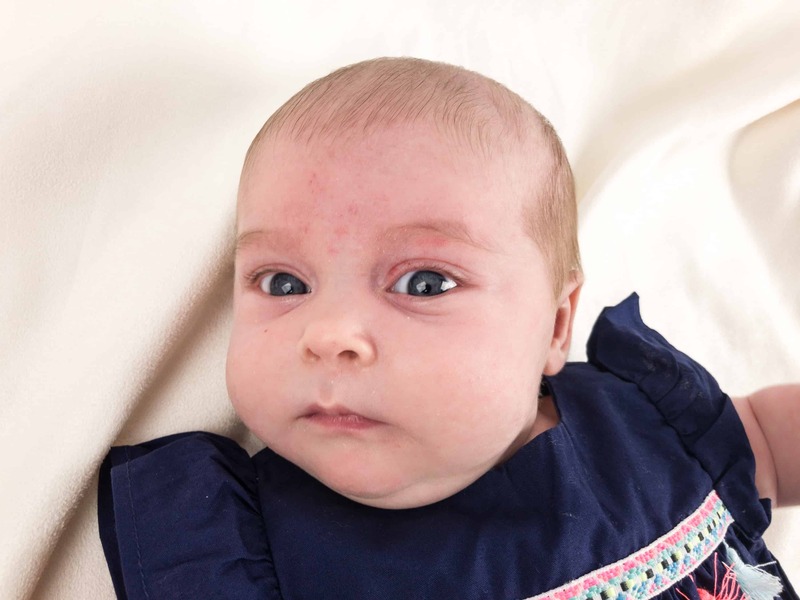 Also, they are aware that babies and kids grow up so fast and so they will send clothes the next size up to make sure it catches up to your growing baby. 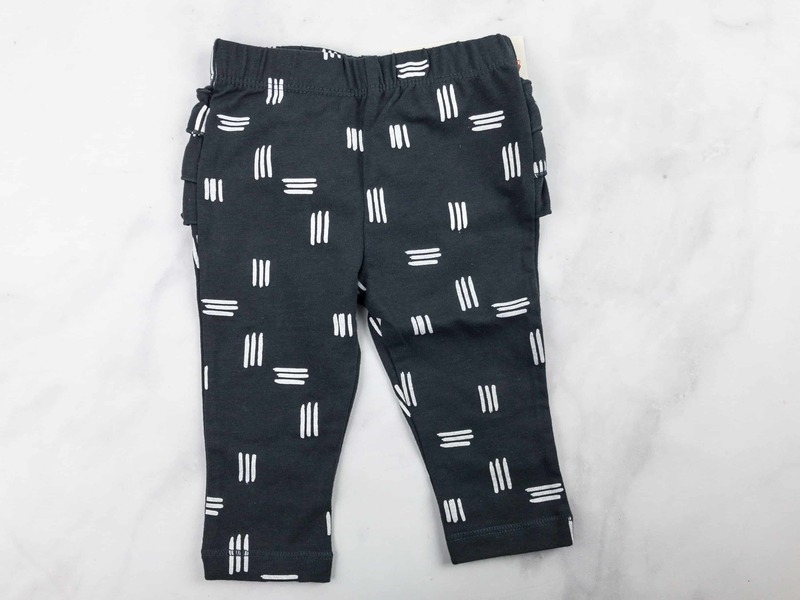 You can also adjust sizing using your Target.com account. The items in the box are neatly packed and wrapped. They have included a small card that contains a bit of information about the subscription. There’s even an official hashtag to use. 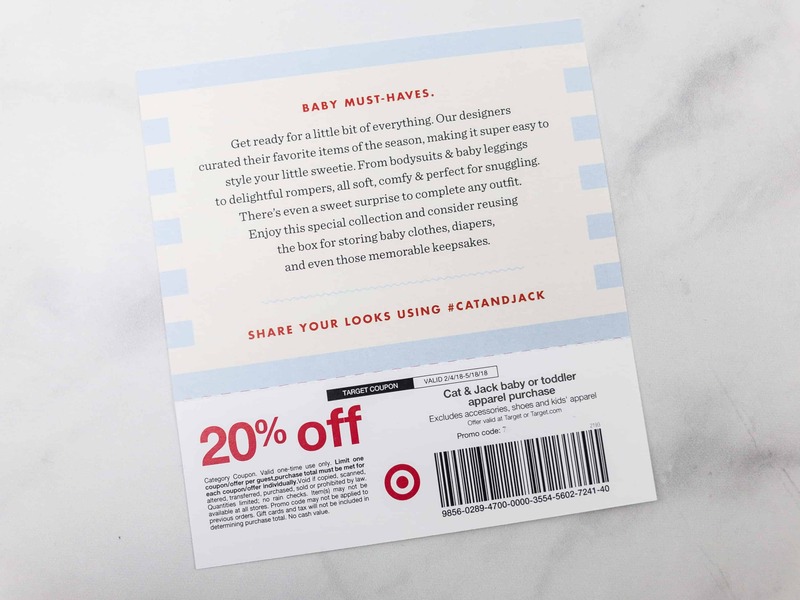 As a bonus, attached to the card is a coupon for 20% off on all Cat & Jack baby or toddler apparel purchases. Meanwhile, here’s a list of all the baby outfits included in the box. Unfortunately they didn’t include pricing information even though you can return individual items, or information about which item was the bonus. I found it quite odd! The thin paper wrapper has the Target logo all over and there was also a cute sticker that sealed it. I like what I’m seeing! It’s definitely filled with a lot of cute baby clothes. Note that my order receipt had links for the individual items – we have used the links in case they do come into stock, but most of them pretty much go nowhere. 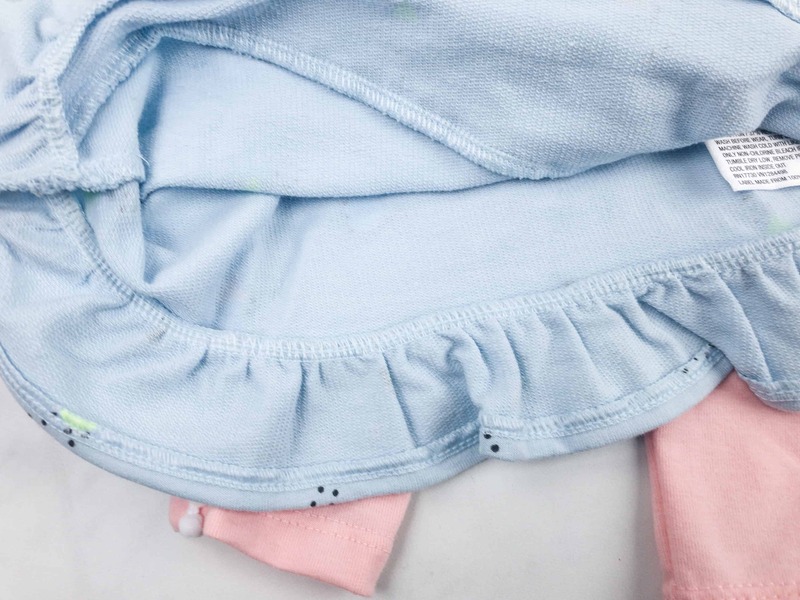 Cat & Jack Baby Girls’ Sweatshirt and Leggings Set (est $9.99)This pair is composed of a long sleeved baby blue sweatshirt top and peach leggings. The details are so cute! The top is printed with small shapes and dots. There are also ruffles at the bottom hem. It was stitched quite well! The inside of the sweatshirt is french terry so it’s warm without overheating. The pants were soft and stretchy. The pretty little pompom trim on the sides made it even cuter! Here’s my baby, wearing the ruffled long sleeved top and peach leggings. The set fit her just right. 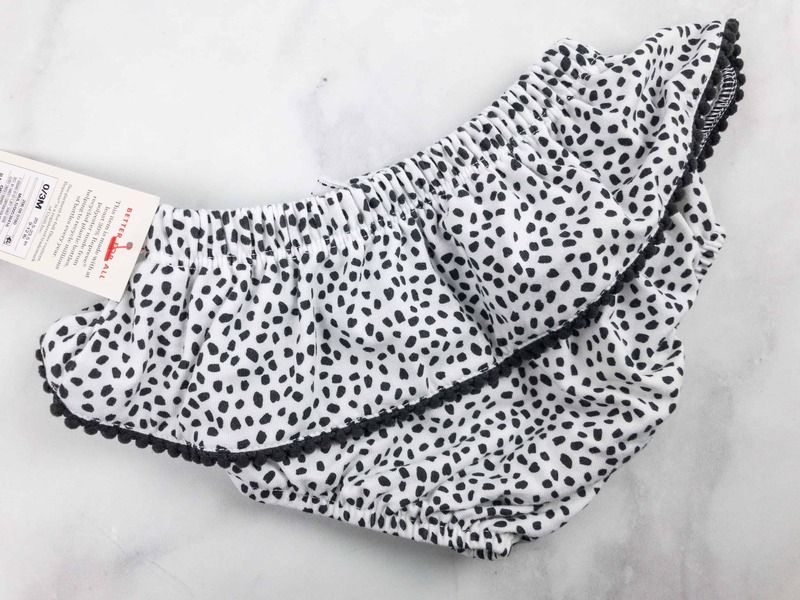 Cat & Jack Baby Girls’ Polka Dot Bloomers (est $4.99) This pair of bloomers feature an elastic waistband, as well as elastic leg openings. It’s easy to wear and remove, plus it provides great coverage. It’s so cute I’m going to die. 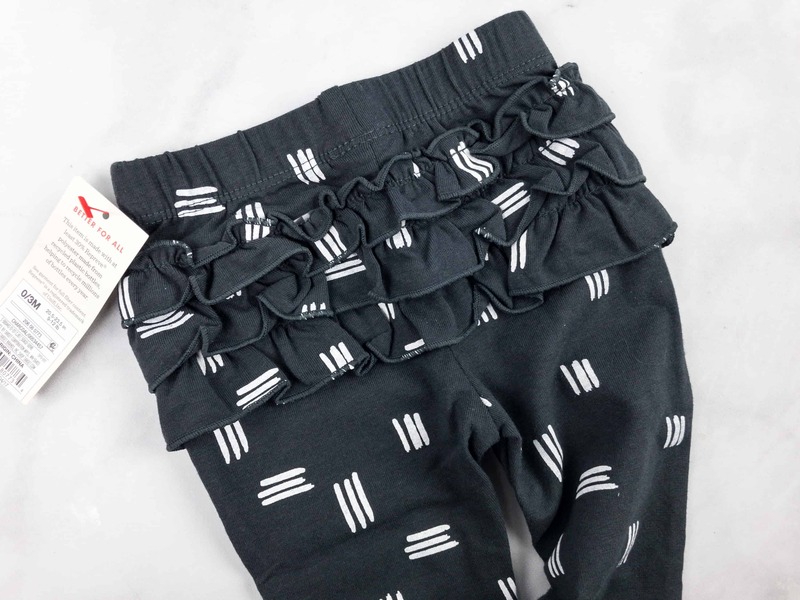 Cat & Jack Baby Girls’ Leggings with Shapes Print and Bottom Ruffles (est $6.99) These black leggings are decorated with white stripes and accented with ruffles. It’s a simple pair of leggings, except for the ruffles at the seat. 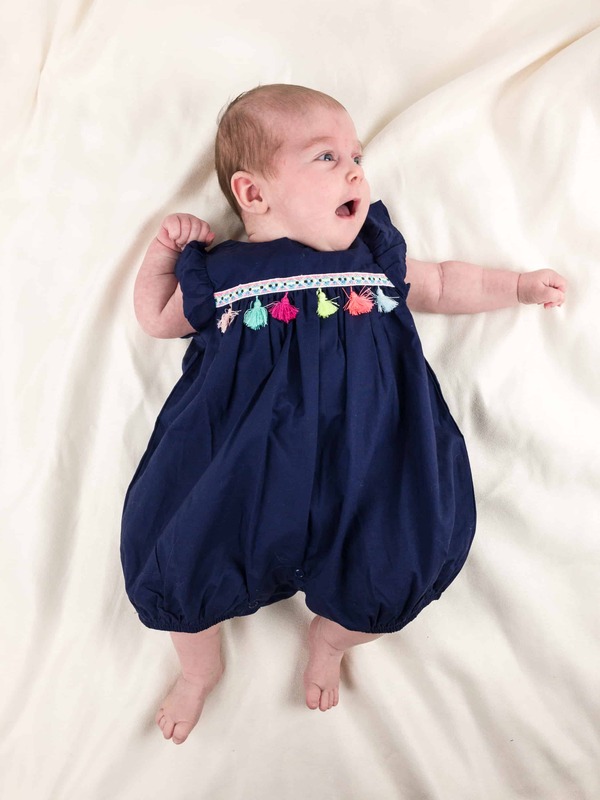 It would be great to pair with a graphic t-shirt or a nice bodysuit for a comfy yet cute baby spring outfit! Cat & Jack Baby Girls’ ‘fearless’ Short Sleeve Bodysuit (est $4) Speaking of a nice bodysuit, we received one in pink. It features the world “fearless” in a gold script across the front. 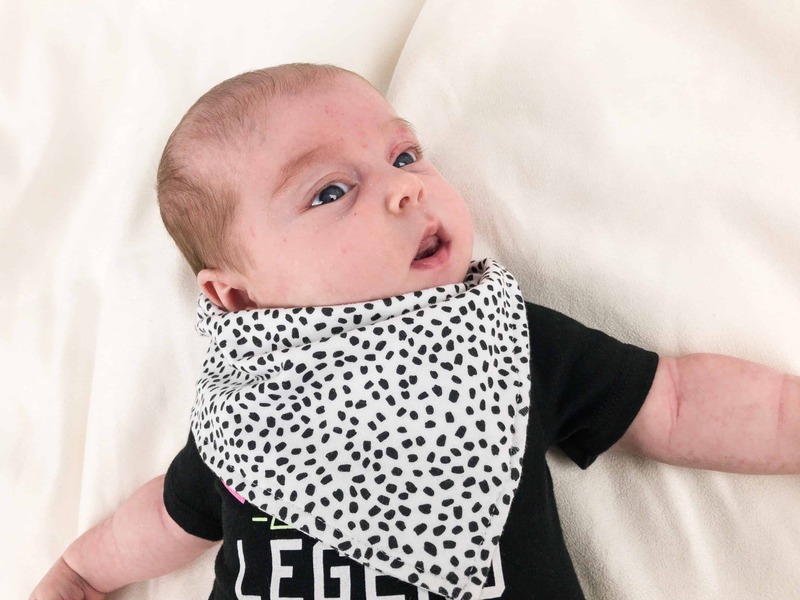 It’s super adorable, and the material is breathable too! I found it a bit odd that the price information was removed from the items but noted on the tags that many of the items were made out of polyester that started as plastic bottles! In this photo, she’s wearing the pink bodysuit and the ruffled leggings. 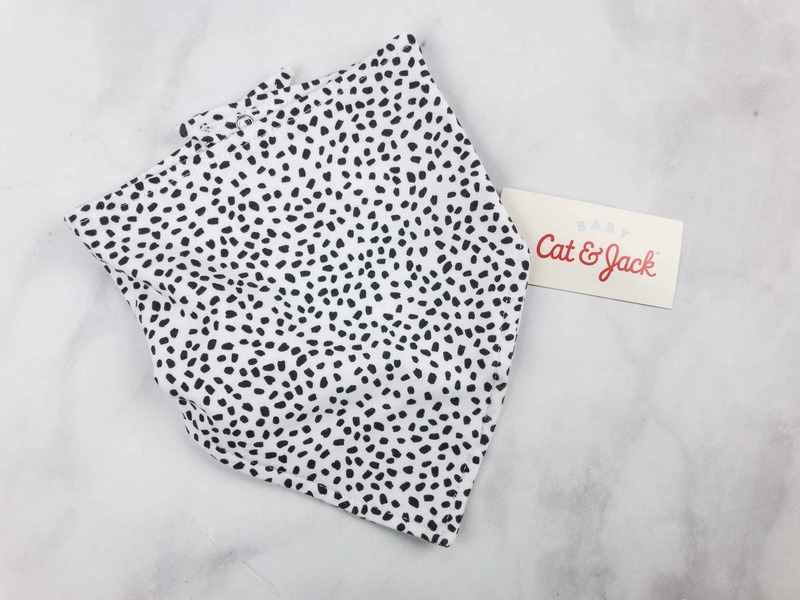 Cat & Jack Bib (similar $3.99) The bib has a similar pattern to the bloomers! It can be easily fastened using the snaps at the back. Here’s my little lady sporting her new bib. 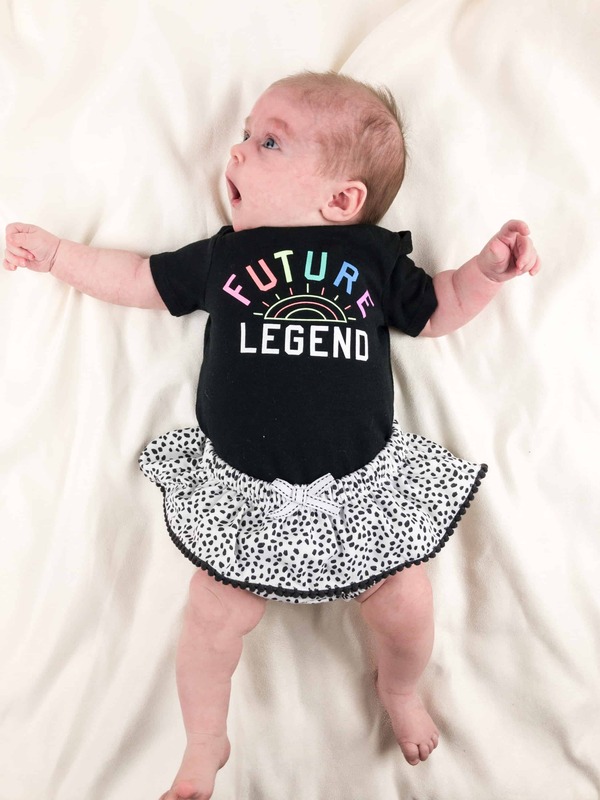 Cat & Jack Baby Girls’ ‘Future Legend’ Short Sleeve Bodysuit (est $4) Another short sleeve bodysuit was included in the box and this time it’s in black. 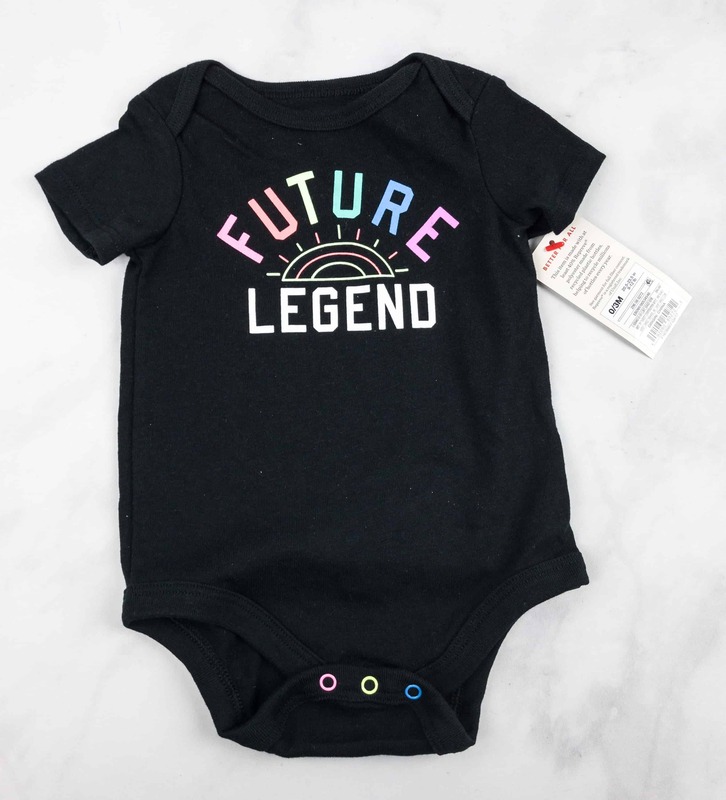 It features a colorful rainbow in front, with a print that says “future legend.” The snaps at the crotch are in rainbow colors. My grandma just loved this one! The black bodysuit and bloomers made a really adorable combination! 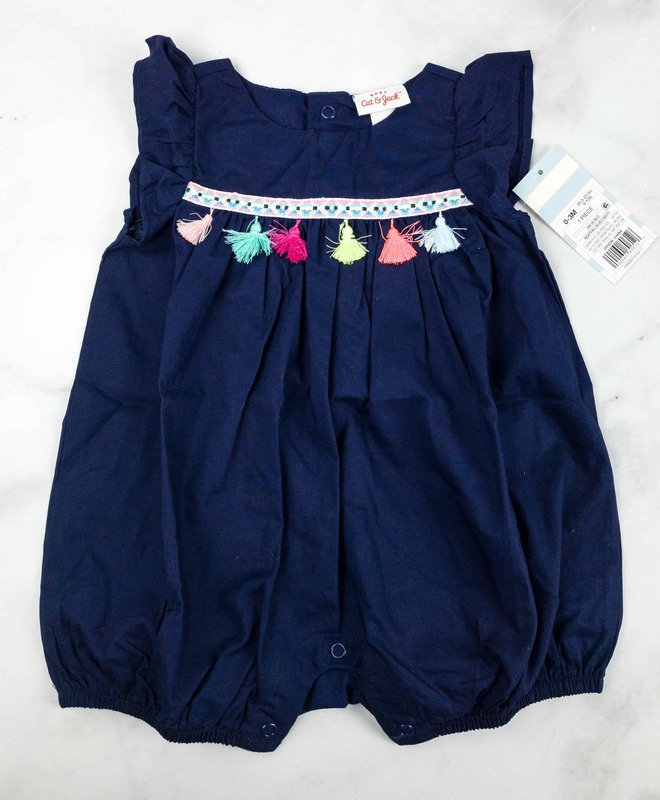 Cat & Jack Baby Girls’ Ruffle Sleeve Romper (est $9.99) Rompers are cute and easy to wear, making a nice alternative to onesies. 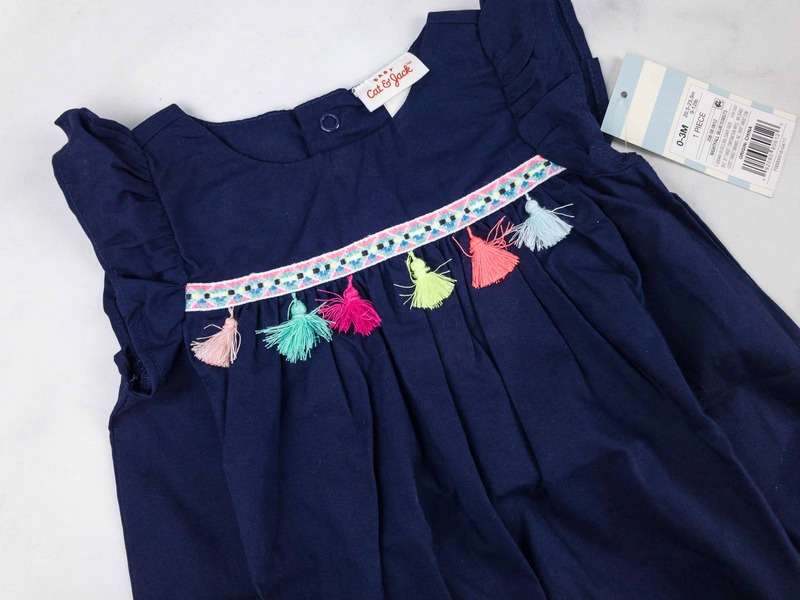 This navy blue romper was decorated with tassels to make it look more fun and colorful! This romper seemed a little too big. 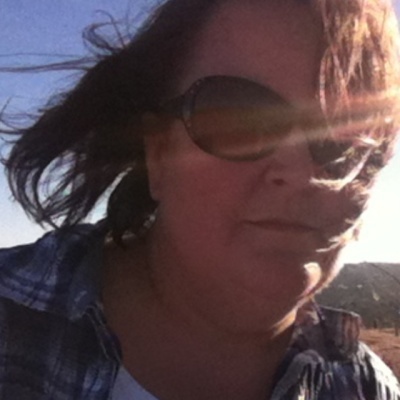 Maybe that was just the style but the size was much larger than the other items. Ok by me since it’s still early spring. For its first box offering, Cat & Jack did a pretty good job in picking out items for my baby girl. 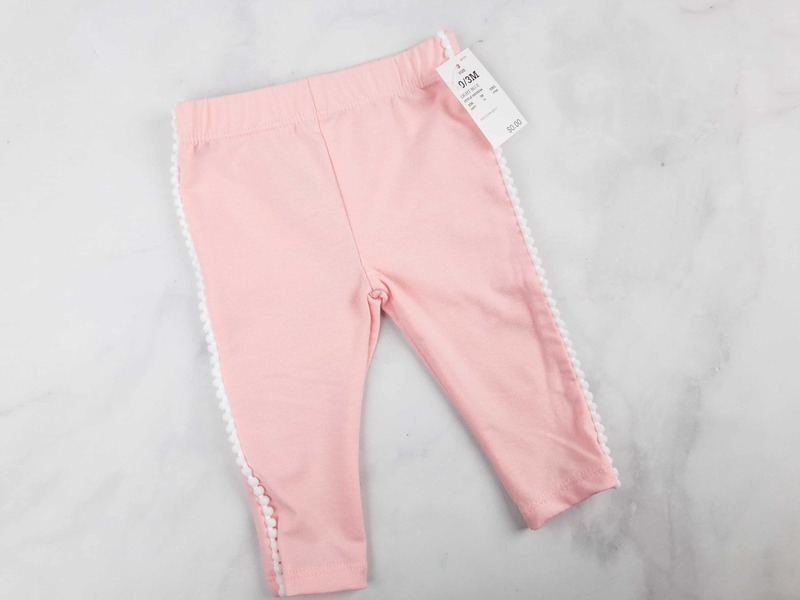 We loved everything from the body suits to the cute little pants and they even included a matching pair of bib and bloomers. The best thing is that we got all of these (a total of eight pieces of clothing) for only $40! My baby is now ready for spring! Unfortunately there really isn’t a cost savings to the box. Based on my estimates off of similarly styled Cat & Jack clothing the entire box adds up to $43.95, including the bib. 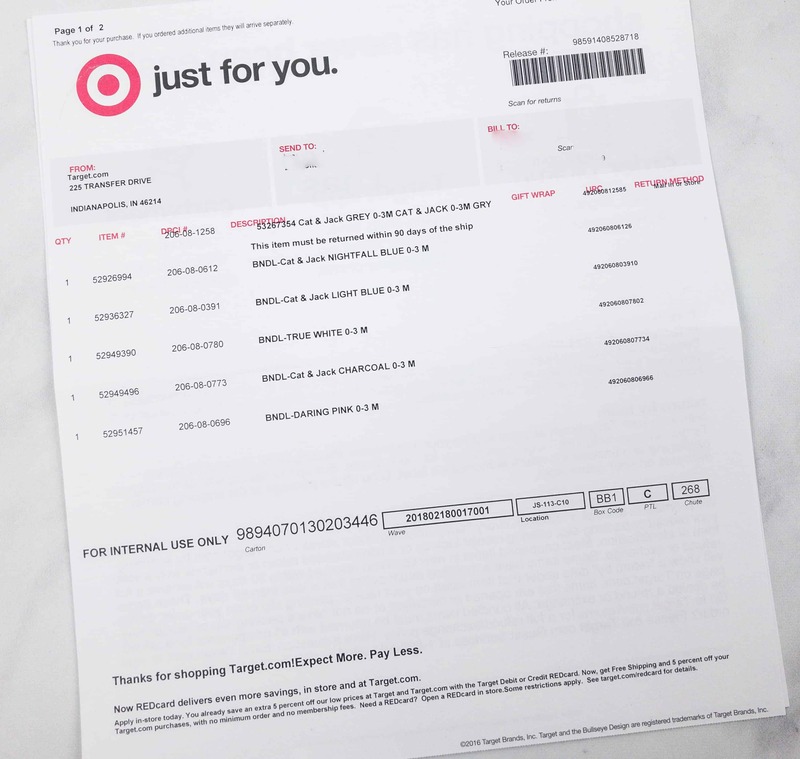 It’s totally break even and the included coupon isn’t quite tipping the scales – there are similar coupons available frequently from Cartwheel. The items appear to be exclusive to the box (they’re supposed to be available in the box before they’re available in the stores but even a few weeks later we can’t find them online). This box appears to boil down to convenience, but shopping at Target is already convenient, especially if you’re a Target Red Card holder. 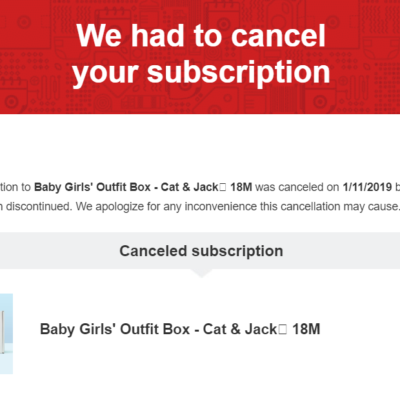 I need one more outfit in this box to make it an amazing value for a mystery subscription versus their every day pries. 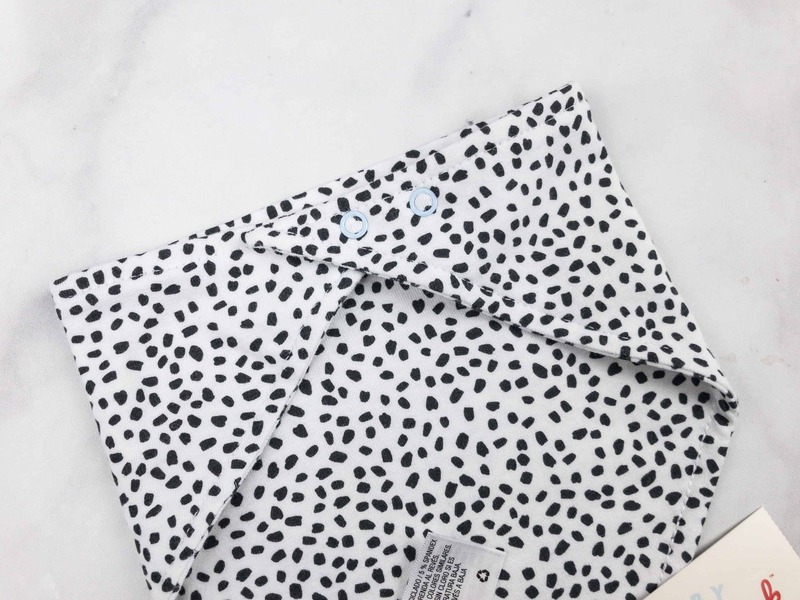 One of the weird things is that the bonus items for boys and girls was different – boys received a pack of wipes (see full spoilers for the boys box here), while girls received what is typically considered a boyish bandana bib. It would have been great for everyone to receive the same item (or both!). I also couldn’t help but wish the boys and girls boxes were more coordinated. Plus, demand for this box was high, and we fielded a ton of questions on whether it would be available in larger sizes. It’s obvious that everyone would have loved to purchase a box for larger sized kids – maybe next season? 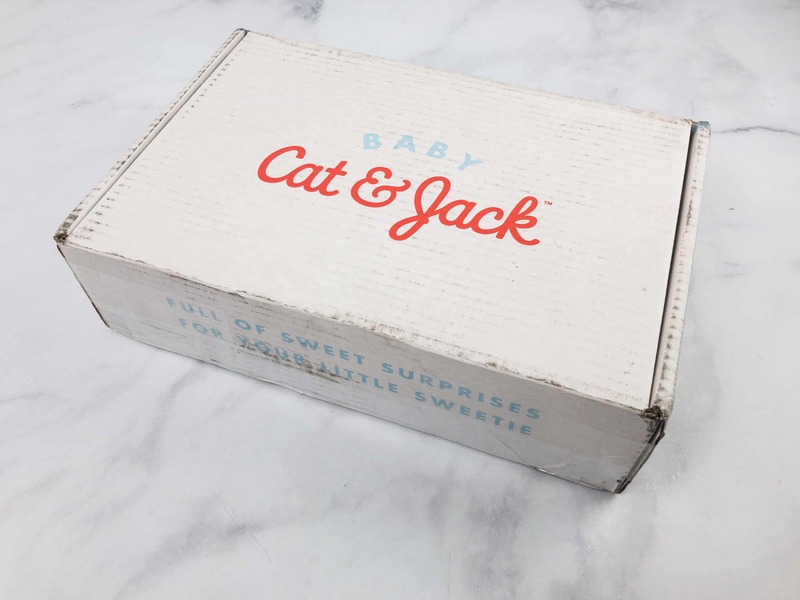 What do you think of the Spring Cat & Jack Baby Outfit Box? 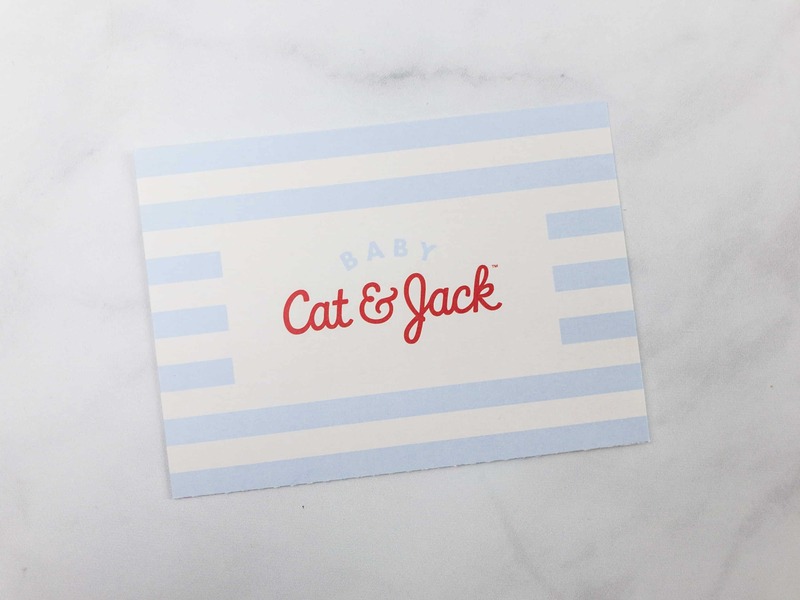 Visit Cat & Jack Baby Outfit Box to subscribe or find out more! 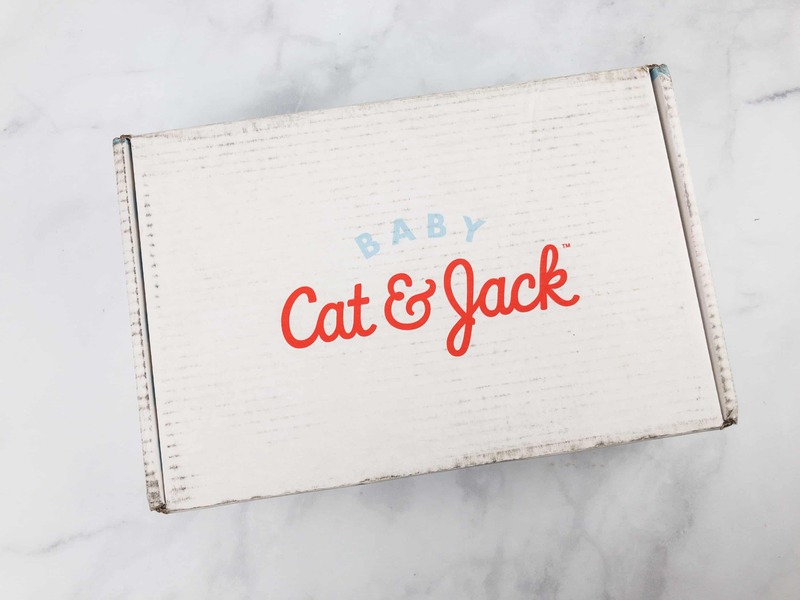 Target's Cat & Jack Baby Outfit Box delivers 6–7 pieces that haven’t been released yet, plus a surprise gift in sizes newborn to 24 months. A new box will be delivered every season! They’ll automatically send the next size up to match your growing baby.